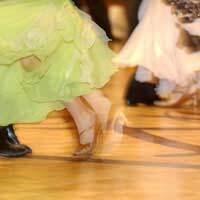 Home > Learning to Dance > Should You Enter Dance Competitions? While ballroom competitions are often divided according to skill level, many other competitions are split according to age. Therefore, it is important to be aware of where you stand technically in terms of your age group. Most dancers who choose to compete have been dancing for a year or two at the very least. If you’ve been training for less time, you may want to consider waiting until you’ve had more time to pick up the technicalities and nuances of your chosen style of dance. Even the most experienced dancers are constantly learning so you’ll want to be sure that you’ve given yourself ample opportunity to draw on the knowledge and skills of your teachers. Remember, the dancers you’ll be competing against will most likely have an intricate knowledge of their steps and a clean execution. The rehearsal period leading up to a competition can be gruelling for any dancer. So make sure you are prepared by figuring out exactly what it is you need to work on. If you’ve been working with the same teacher for an extended period of time, odds are he or she can help you with this. Since you’ll want to make the most of whatever rehearsal time you have, ask teachers and friends to keep an eye out for any toes that need pointing, hands that need flexing or turns that need tightening. If you work specifically on the things that give you trouble, your routine is more likely to look clean and polished when it comes time to perform. Between the costs of costumes, shoes, makeup and entrance fees, a single competition can quickly become a bank breaker. Be sure to inquire about all entrance costs before registering for any competitions and make sure that it is within your budget. If you are competing with your studio, find out whether or not the studio is able to cover any of the costs or if they will charge you any additional fees for organising. If you are not paying your own fees, be sure to consult with your parents or other sponsors before you agree to perform. Are you Prepared Mentally and Emotionally? In addition to the physical demands of the rehearsals and the competition itself, competing can sometimes also be a mentally trying experience for the dancer. It is important to let go of oversensitivity when it comes to competition. Almost always, mistakes will be made, zippers will come undone and hairpins will fly. You may feel like you haven’t done your best performance or feel intimidated by other performances. For all of these reasons, it is important to focus on having fun rather than scoring points. Although the experience of competing will certainly build skills and boost talent in the long run, glitches on the day are bound to arise and you should take them with a pinch of salt. After all, you’ll have worked so hard to get there, you deserve to enjoy the day to the fullest. Are you in it for the Right Reasons? Although succeeding at competition can be extremely rewarding, it is ultimately an important learning experience for all dancers involved. Receiving constructive comments from the judges, working towards a specific goal and sharing your love for dance with other dancers are the experiences that make competition enjoyable and worthwhile. If these strike you as the exciting elements of dancing competitively, then you might be ready to sign up, dress up and show ‘em what you’ve got! I got a dance group that would love to be in competitions my group name is Yada and they love what they do and that's dance.